Obituary – Dorl, Jack Eugene « Perry High School Alumni Association, Inc.
D. E. 49-51, Journalism 50-51, Basketball 47-50, Football 48-51. 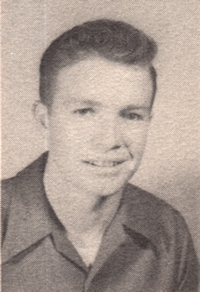 Jack E. Dorl, 80, of Perry, Oklahoma, was the son of Fred and Rose Zomotoney Dorl. He was born December 10, 1932 in Yale, Oklahoma and died Saturday, February 16, 2013 at Integris Baptist Medical Center in Oklahoma City, Oklahoma. He was a graduate of Perry High School class of 1951. Jack served his country in the United States Marine Corp. He served a tour during the Korean War, and was honorable discharged on April 17, 1954. He married his best friend and sweetheart Mary Ann Edwards on February 20, 1955 at St. Rose of Lima Catholic Church in Perry, Oklahoma. Jack owned and operated Jacks Barber Shop for over fifty years, where he and his patrons discussed and solved many local, state, and national issues. 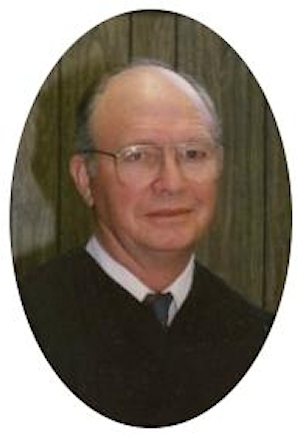 Jack served as a judge for the Perry Municipal Court from 1977 until his retirement in 2009. During his time as a judge he was a past president and served as director for twenty three years on the Oklahoma Municipal Judges Association. He was the first recipient of the Oklahoma Municipal Judges of the Year Award. Jack was the past president and served as director for twenty two years on the National Judges Association. He was the recipient of the Mac Acreain Award, the highest award given to a non-attorney judge in the United States. Jack was one of ten judges invited to the Peoples Republic of China for ten days to inspect their courts and prisons. Jack was a member of St. Rose of Lima Catholic Church, Knights of Columbus, and the American Legion. He was a member of the Perry Rotary Club where he served as President and also received the honor of a Paul Harris Fellow. Funeral mass will be 10:30 a.m., Wednesday, February 20, 2013 at the St. Rose of Lima Catholic Church in Perry, Oklahoma. Father Robert Wood will officiate. Interment will be in St. Rose of Lima Catholic Cemetery in Perry, Oklahoma. Services are under the direction of BrownDugger Funeral Home in Perry, Oklahoma. Family will receive friends from 6:00 p.m. to 8:00 p.m., Tuesday, February 19, 2013 at BrownDugger Funeral Home in Perry, Oklahoma. Memorials may be made to the Catholic Charities or the American Diabetes Association in care of BrownDugger Funeral Home, 1010 N. 7th Perry, Oklahoma 73077. Jack is survived by his wife, Mary Ann of the home two sons, Richard Dorl and his wife, Robin, Tim Dorl both of Stillwater, Oklahoma two daughters, Susan Burris and her husband, Wayne of Smyrna, Delaware, Lynette Luttrell and her husband, Tom of Enid, Oklahoma brotherinlaw, Archie Fassnacht ten grandchildren, and one greatgrandchild. He is preceded in death by his parents, Fred and Rose three brothers, Dale Dorl, Wilbur Dorl, and Dewayne Dorl two sisters, Alene Fassnacht and Nadine Dorl.